The ports and cities of the Land Down Under are dazzlingly different. From wildlife in Townsville and snorkeling at Fitzalan Island, to Brisbane's pretty waterfront parks and koala sanctuary. We'll take you from the breathtaking coastlines in Melbourne to the famous penal colony at Port Arthur. In Cairns, stunning rainforests and waterfalls are only a train ride away, or learn about Captain Cook in historic Cooktown. Travel from the outback feeling of Darwin to beautiful Sydney, the city that's got it all. In fascinating New Zealand, sail the scenic Milford Sound, visit famous Marlborough wine country near Picton, or explore Tauranga's lush kiwi farms. Discover Rotorua's Maori culture and geothermal springs, stroll charming Akaroa, or spend a lovely evening onshore in Wellington. Don't believe us? Come see for yourself.. The ancient Romans called the Mediterranean Mare Nostrum, Our Sea. Now it can be yours. Lands of great antiquity and mighty empires. Sunny Greek isles with whitewashed villages cascading down hillsides, and the Riviera, glittering and glamorous. Black Sea ports, a blend of East and West, with historic names like Yalta, Sevastopol, and Odessa. Whether your dream is wandering the cobbled streets of medieval villages, savoring a latte or a glass of vino in an outdoor cafe, or solving the riddle of the Sphinx, it can come true on one of these voyages. The lavish lifestyles and warring ways of kings and courtiers of old left behind the extravagantly decorated Winter Palace in St. Petersburg, the undoubtedly haunted fortress of the Tower of London, and the majestic Cathedral of Notre Dame de Paris for you to explore. There is also a new Europe, as many cities are experiencing a burst of architectural creativity that is adding excitement to the scene. Not to be outdone, Mother Nature offers the splendors of the far north, in the breathtaking majesty of the Norwegian fjords, and the unique landscapes of Iceland, realm of fire and ice. Asia is ancient, mysterious, and exotic. Asia is cutting-edge and technologically savvy. China claims the world's oldest continuous civilization, but its metropolis of Shanghai is firmly fixed in the 21st century, with levitating high-speed trains, and a jaw dropping cityscape of space age towers. Bangkok's traditional temples will also catch your eye - colorful and abundant, they sport golden spires and layered roofs that appear to float one upon the other. And everywhere the markets - rainbow-hued, spice-scented, and boisterous, they are a unique opportunity to immerse yourself in the local lifestyle. Let Azamara take you to extremes. From the fiery Latin rhythms and feather-festooned frenzy of Carnival in Rio to Tierra del Fuego and on to the blue-white ice of Antarctica - literally to the ends of the earth. Marvel at the mighty Amazon on a voyage 1,000 miles upstream, the wilds of Patagonia, and a wealth of wildlife including penguins by the thousands. While the natural world is thrilling, you'll be equally enthralled by the stunning beaches, charming colonial towns, and elegant and sophisticated cities you will find in South America. Talk about Serendipity! Columbus went looking for an easier route to "the Indies", and bumped right into a whole new world - one lush palm-fringed paradise after another. Once the word was out, adventurers from all over Europe followed, and the islands passed from hand to hand, each one adding a little bit of seasoning to the pot. Add to that the African flavors contributed by the slaves brought in to support the production of sugar and rum, and you have a complex and spicy brew: each island a little bit different, but all laid back, simply sublime, and a whole lot of fun. Azamara Club Cruises includes late night or overnight stays on more than half of all port visits -- which means you'll have even more time to explore the beauty, history and cultures of the Panama Canal, and Central America. Celebrate the 100th anniversary of the Panama Canal in 2014, as well as the opening of the second canal locks. Experience the Sea of Cortez during the peak of whale watching season. Embark on an incredible array of Central American explorations -- from white beaches and volcanic landscapes to wildly lush rainforests, colonial architecture and Mayan culture. Full cultural immersion takes time and is a process that should not be rushed. By embarking on an Extended Voyage with Azamara Club Cruises, you can enjoy and truly immerse yourself in distinctive cultures from around the world, all at your leisure. Azamara's Extended Voyages allow you to combine several voyages into a trip of a lifetime while also providing you with incredible savings. With a minimum savings of $600, there's no better time to begin your voyage around the world: seeing and savoring all it has to offer. 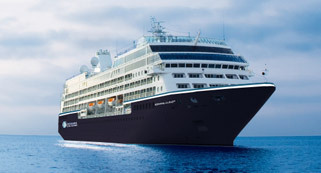 For a voyage this grand, you want a travel partner like Azamara Club Cruises. We know the world and delight in sharing it with you. Take a leaf from the book of travelers past, when getting there was half the fun, and an ocean liner was, in the words of shipping historian John Maxtone Graham, "the only way to cross". There is an aura of romance and nostalgia on an ocean voyage, harking back to the days when passenger ships vied for the coveted Blue Riband, granted to the fastest vessel to cross the North Atlantic. It's perfect for blue water sailors who value their time at sea, and for all those who want to savor unscheduled hours, with no need to rush. Fore! Golfers, don't miss these exclusive golf voyages brought to you by Azamara Club Cruises and PerryGolf, the leader in luxury golf vacations. Play fabulous rounds on world-renowned courses, choose from the Tom Morris or Arnold Palmer flights, or attend the 2015 British Open. Whether you're making new friends or golfing as a couple, guests onboard our golf voyages have at least one thing in common -- a love of golf. But there's plenty to love for non-golfers, too: fabulous onboard facilities, a wide selection of Land Discoveries shore excursions offered at each port, or some relaxing 'sea time' under fine Mediterranean skies. This on top of exceptional golf arrangements: From daily pairings to caddie arrangements and the handling of your golf clubs -- which will be set up at each club awaiting your arrival from the ship -- PerryGolf staff will oversee all aspects of your golf experience.